Freshman foilist Jen Yamin competed during the 2013 NU Duals. Yamin and the Wildcats notched their first upset of the season last weekend, defeating Penn State. The Wildcats’ season so far has been characterized by consistency, but an odd weekend on the road saw Northwestern on either end of two upsets at the Duke Duals in Durham, N.C. on Sunday. Sunday morning saw a slow start from the Cats, who stumbled out of the starting blocks with a loss to No. 11 Duke. Although Grainger won her three bouts to help push the sabre squad to a 5-4 win, a 7-2 loss by the epee squad put the Cats in a hole against the Blue Devils, and the rest of the team was unable to make up the difference. After a disappointing start to the day, NU came out in its second match ready to fight. Taking on Penn State, a team NU had not beaten since 2008, the Cats put forth a determined effort to take the match from the No. 5 Nittany Lions. 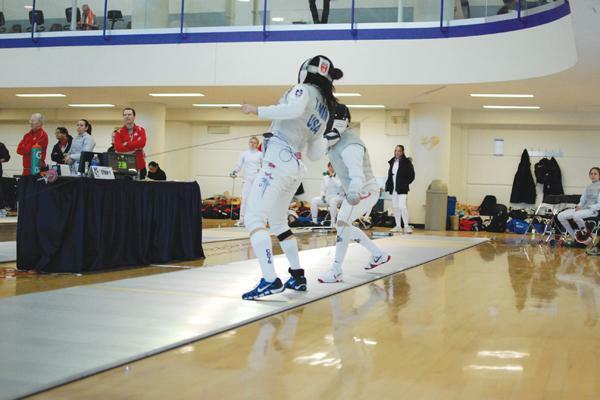 The epee squad rebounded from its morning loss to decisively win 8-1 to help propel NU to a 17-10 victory. While the Cats have had close matches with their higher-ranked opponents all season, their win over Penn State marked the first time NU scored an upset in 2013. The Cats closed out the weekend with an 18-9 win over North Carolina, their second victory over the Tar Heels in one week. With a 34-7 record on the season, NU now has just one set of dual meets left at Notre Dame to try to score another upset before the end of the regular season. The majority of the team will have an off-weekend this weekend while nine of the team’s younger competitors will be travelling to compete individually and as squads in the Junior Olympic Fencing Championships in Baltimore, Md.